That teaser we were seeing from Sony the other day? It turns out that Sony has had an awesome surprise in store for us, as it just introduced the Xperia T3, dubbed "the world's slimmest 5.3" phone." We can't argue with that, as there aren't many 5.3" handsets lying around to measure against. We kid, but the svelte T3 is indeed very thin at just 7mm, and if you are worried about the IPS-LCD Triluminos screen resolution, you can relax now - it's decent at 720x1280 pixels, with 277ppi pixel density. The processing power is a bit on the slow side for today's standards, as the Xperia T3 gets powered by a 1.4 GHz quad-core Qualcomm Snapdragon 400 processor, but hey, this is the new midrange now, and it looks pretty svelte with the 150.7 x 77 x 7 mm chassis, built around a stainless steel frame, with an aluminum power/lock key on the side. The memory situation includes 1 GB of RAM, 8 GB of internal storage, and a microSD slot that takes up to 32 GB cards, if you want more. There is an 8 MP Exmor RS sensor on the back for snapping and 1080p video purposes, and a 1.1 MP front-facing camera that does 720p recordings. Power is provided by a 2500 mAh battery, that Sony cites as good for 12 hours and 46 minutes of talk times, and 8 hours and 14 minutes of video playback, which is quite the good result. Naturally, Android 4.4 KitKat with Sony's own Xperia UI are loaded on the handset, too. 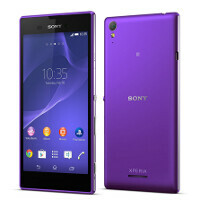 The Xperia T3 will be available in three colors - black, white and violet - and should be hitting the shelves by the end of July for a midrange price tag. 400€ is too much. It should be under 400$ for a Snap 400 and a gig of ram. You could buy 3 Moto Gs with same specs (except for the cam). To be honest, I would rather buy a last years flagship than a modern midrange device. And I already got my Nexus5. Wanted to buy G2 but I find the Nexus more interesting. The LG G2 is a great choice. The price is super low but the specs are still great. bought it just last 2 weeks.. best investment ever..
Sony is overpriced anyway, real mid range would be something like the moto x. Exactly... at the same price, you get a better camera, a better screen and so on. i think your resolution detail is incorrect. go to the official sony website. it says there it's a 720p panel, not 1080p. Agree, why don't they get rid of those big bezels, orelse it would be a killer looking design that everyone is following Sony's ubiquitous design. Yes, it's slim. It's a pity that the other specs are junk. Sony deliberately crippled this phone with 1GB of memory! Why Sony WTF?! if i am phone manufacturer, i will release a 12mm thickness phone and 4.813 inch screen , and say it is "the world's slimmest 4.813 inch smartphone"